One you walk in all three of your senses are activated, smell with the food, sight with the lovely décor and sound with the live jazz music from the pianist. There is ample seating and both ends of the building offer an option for some nice sunlight. We sat near the back window and soaked up the sun and took advantage of the view of the back. Each of the tables has a small vase and fresh flowers in them which was a very nice touch. The piano is situated in the center of the room and a pianist comes to play it and it adds another dimension to your brunch experience. All these little things are great ingredients now only more item to complete the meal and that’s the food. With breakfast/brunch served all week long you can duck any time and get a tasty and varied selections that is priced anywhere from six dollars to twelve fifty. 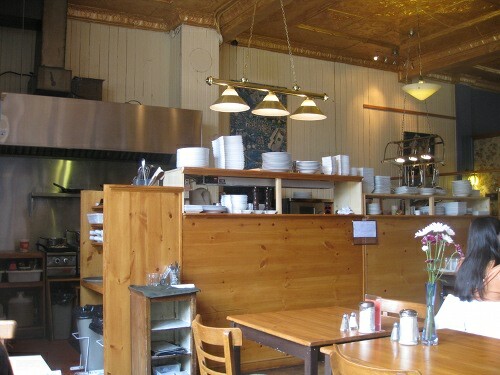 The menu is not exactly 100% classic Canadian but has a touch of bistro style to it. You can get a variety of eggs plates ranging from $6.00 to $10.00 its well balanced with even a vegetarian plate served with grilled vegetables ($8.50) and a lumberjack plate ($10.00) which comes with sausage , ham, chorizo and creton. All of the plates come with two eggs a bottomless cup of coffee, potatoes, choice of bread and you can add an extra egg for $1.50. The omelets are made of 2 eggs and are priced between $9.50 and $12.50 most are vegetarian with some highlights like the “Entretiens” made of spinach, tomatoes, nuts, and goats cheese; The “Greek omeltte” served with Klamaa olives, tomatoes, onions and feta; and the “Portuguese” which is chorizo, peppers and fresh herbs. 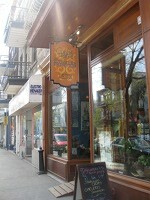 They also have house crepes priced between $10.00 to $10.50. They also have breakfast sandwich section with three options such as cheese and brie ($6.50); eggs ham and cheddar ($9.00) and smokes salmon and crème cheese ($10.50). Lastly they have a fruit section for the health conscious ones with French toast and fruit ($7.50), the oatmeal pears, yogourt fruit and nuts ($6.50) is quite unique and well priced as well the yogourt and granola dish is a decent price at $8. Now that we broke down the pricing and selection of the menu time to get to the good part: taste and presentation. 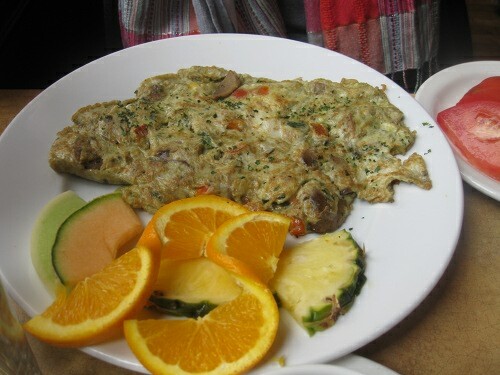 We ordered the vegetarian omlette ($9.50) which came with grilled vegetables, herbs and spices. It came as a generous portion size and with a side of four different fruits. The taste of the omlette was quite fresh and the herbs and spices really made for some bold flavours. 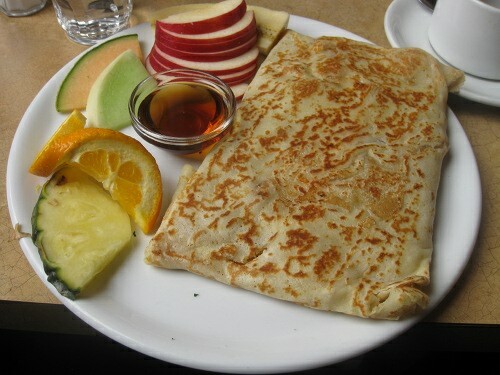 Lastly we had the apple brie and nut house crepe ($10.50) the crepe came served as a closed rectangular crepe. It came with a side of six varied fruits and real maple syrup. The inside of the crepe was bursting with flavour and the combination of apple, brie and nuts married in a crepe is a brilliant idea the brie was pronounced and the nuts and nuts and apples complimented it perfectly, as well the size was just right and help satisfy a hungry patron. The staff was really nice and they were also jammed when we arrived, they were very friendly, the one problem was that when my friend had to remind them for her toast with no butter but even she agreed that its not a popular request and many places get it wrong. 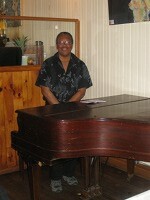 Other than that issue service was great and we got live music from a pianist something you will not find elsewhere. There are lots of vegetarian options on the menu in fact around half of the menu is vegetarian friendly. There is even a vegan option with the fruit bowl and granola although besides that vegans will as always have little choice. Café les Entretiens is a feast for the senses and light on the pocket book. The food was good, décor amazing, live music an amazing touch. I definitely suggest that if you are in the area to make a trip there and if you are looking for a place where you dining experience will be more than one dimension then do check this place out you will not regret it. Monday-Friday 9:00 a.m. – 11:30 a.m.
Saturday – Sunday 9:00 a.m.- 4:00 p.m.